PARTICIPATION Page - U.S. Constitution Week in Grand Lake, Colorado the Premier and First Constitution Week Celebration in America! 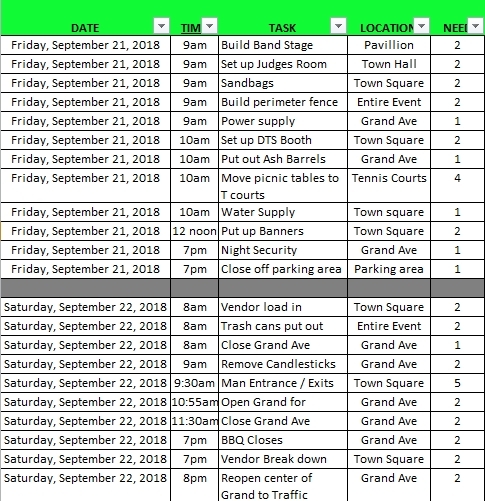 Download the application to have a nonprofit booth in the park here: 2018 US Constition Week non Profit booth application. Follow this link to the web page for the TOWN of GRAND LAKE that will help vendors obtain the necessary permits from the Town of Grand Lake needed to participate: LINK to the Town of Grand Lake, Colorado to obtain PEDDLER LICENSE. Constitution Week is always looking for folks who would like to volunteer and help us with this event. Below is where and how many folks we need.